Sound-Rage, commonly known as “Misophonia,” is a little known disorder characterized by an anger response to certain sounds. Gum popping, food chewing, nose sniffing, pen clicking… fingers pointing, legs swinging, hair twirling…. For the vast majority of people, these sounds and sights are meaningless. For a small minority of the population, these sounds and sights are triggers that lead to instant rage and set off a physiological urge to flee. 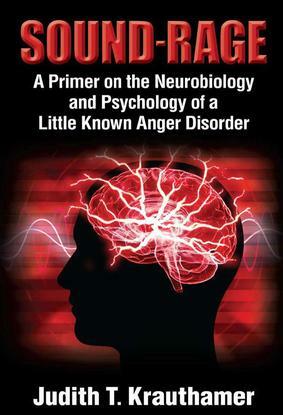 The primer presents groundbreaking research on the neurobiology and psychology of the disorder, and provides compelling evidence that “Sound-Rage” is a neurological, developmental disorder that alters neural processes in the brain. It discusses why cognitive behavior therapy is the most effective treatment for reducing symptoms. In Section I, Symptoms, Stories and Diagnoses, the book describes the life of a “Sound-Rage” sufferer as she confronts triggers throughout the day. Section II Neurobiology delves into the neurological study and explores how the brain processes information, specifically the triggers. The daily onslaught of discomfort generated in “Sound-Rage” is exacerbated by the thoughts and associations that accompany the anger and pain and this is addressed in Section III Emotions, Cognitions and Therapies. Judith T. Krauthamer is a writer, scientist, and researcher. She holds an undergraduate degree in psychology, a master’s degree in science from Texas A&M University and a graduate certificate in transformative leadership and social change from the Maryland University of Integrated Health. She is published widely in numerous scientific journals and has a compendium of poetry, Brush Fires and Porcelain Roses.